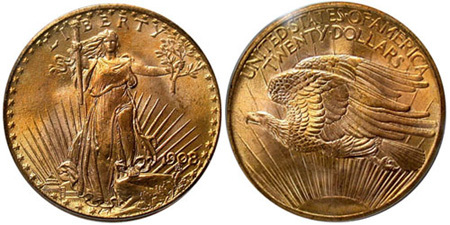 The second series for the twenty dollar double eagle gold coins was designed by famed sculptor Augustus Saint Gaudens. The coins would be produced between the years 1907 and 1933, with the first and the last years of issue both being extremely notable for collectors. For the first year of issue, there were attempts to strike the coin in ultra high relief as the designer intended, but the relief was ultimately lowered. In the final year of issue, the large mintage was not released for circulation and ultimately melted, with a few survivors managing to escape. Depicted on the obverse of the coin was the full figure of Liberty in flowing gown. She holds an olive branch in one hand and a lit torch in the other and steps confidently forward across a rocky crag. Within view in the background is the US Capitol building and rays of the rising sun. This image became iconic for the young and heroic allegorical representation of the United States bringing Liberty to the world. On the reverse was the image of a young bald eagle in flight with the rays of the sun filling the field beneath. As mentioned, Augustus Saint Gaudens intended for his design to be executed in ultra high relief for an appearance similar to the coins of ancient Greece. Despite numerous attempts, this was not possible to be implemented on a mass scale for a circulating coin. The relief was reduced and a limited number of high relief pieces were struck, before the relief was lowered once again for mass production. The design remained as such for the duration of the series. Production would take place at three different mint facilities in varying numbers. The rarities of the series are not necessarily the coins with the lowest mintages, but instead the coins with the lowest survival rates. Because a great number of coins were melted, some years with high mintages have become prized rarities for present day collectors like the 1927-D Double Eagle with just 12 examples known to remain in existence. In 1933, the Philadelphia Mint struck 445,500 pieces. However, all of these were withheld from circulation following the executive order of the President to recall federal gold. The entire number minted was supposed to be melted, except for two examples sent to the Smithsonian Institution. Over the years, a number of pieces have surfaced, which somehow managed to escape melting. However, only a single piece was deemed legal for private ownership.